Once a king performed a continuous fire sacrifice to Lord Shiva for one month with huge amounts of ghee. Lord Agni who accepted all the offerings of ghee in the fire sacrifice became saturated with ghee and became pale (lost all his luster). He wanted to burn something so that all the ghee will be consumed and he can regain the luster. Till this happened, Agni could not accept oblations from sacrifices anymore. He appealed to Lord Brahma for help, who advised Agni to burn the Khandava forest which was destined to be burnt by Providence. There were lot of poisnous snakes and demons living in Khandava forest and they were all destined to be vanquished by the fire. Agni felt happy hearing this and started burning the forest. 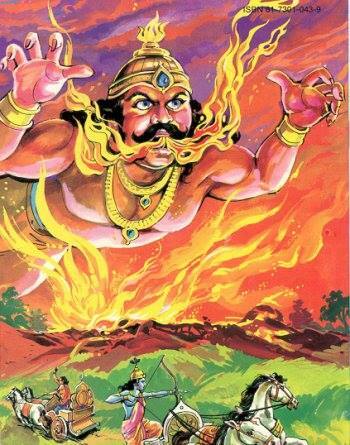 Lord Indra was quiet upset by this act of Agni because Indra’s close friend Takshaka was living in the forest and Indra became concerned about his friend’s safety. So Indra summoned powerful rain clouds and foiled Agni’s fire. And the snakes and the demons living in the forest also started attacking Agni. Agni again surrendered to Lord Brahma for help. And Brahmaji told him, “Please take shelter of the dual warriors Krishna and Arjuna. They can help you out of this situation”. hey agreed to help him provided they were supplied the necessary weapons to fight with Indra. So Agni presented the Sudarshana disc (here again, Sudarshana chakra is an eternal companion of Lord Krishna. So Agni presenting it to Him is just an external show to glorify His devotees and please them) and a wonderful chariot to Krishna and the Gandiva bow to Arjuna. Krishna used the disc and drove away the demons and snakes. Arjuna built a roof with arrows covering the entire forest so that not even drop of rain could fall on the forest. So the rains sent by Indra completely failed. Also Arjuna shattered all the clouds created by Indra using the Vayu astra (weapon of wind) and completely protected Agni. Lord Indra was so please to see the valour of Krishna and Arjuna and thought within himself, “I really don’t want to fight with these great warriors and stop Agni from burning this forest. It is only to save my friend Takshaka I’m fighting”. At that time a voice raised from the sky,”Indra, don’t worry. Takshaka with his entire family has moved to Kurukshetra before this burning. So your friend is safe. Please allow Agni to burn the forest and regain his lustre”. Indra was very pleased to hear this and stopped the war. He also requested Arjuna and Krishna to take benedictions as he was very much pleased by their valour. Arjuna asked Indra for many divine weapons and mantras to control them. Indra granted them all. He asked Krishna to take some benediction. Krishna asked the following beautiful benediction and it is worth meditating for all aspiring devotees like us. In the above story we see that though the Supreme Lord is full in Himself, He nevertheless wants to have unlimited love for His pure devotees and in general all living entities. So in spiritual life, though we may have many material desires and pray to the Supreme Lord to fulfill them, it is important to remember that pure devotional service is the ultimate goal, in which we make no demands to the Supreme Lord except His loving devotional service. Srila Prabhupada writes in his beautiful commentary the Lord’s desire as follows. “The Supreme Personality of Godhead is self-sufficient, but to enjoy His transcendental bliss He requires the cooperation of His devotees. Such pure devotees, who can increase the pleasure potency of the Supreme Personality of Godhead, are certainly most dear to Him. Not only does the Supreme Personality of Godhead enjoy the company of His devotees, but because He is unlimited He wants to increase His devotees unlimitedly. Thus, He descends to the material world to induce the nondevotees and rebellious living entities to return home, back to Godhead. He requests them to surrender unto Him because, unlimited as He is, He wants to increase His devotees unlimitedly. The Krsna consciousness movement is an attempt to increase the number of pure devotees of the Supreme Lord more and more. Although the Supreme Lord is full in six opulences, He does not feel transcendental bliss without His devotees. An example that may be cited in this regard is that if a very rich man does not have sons in a family he does not feel happiness. From the scriptures we understand that the Supreme Lord is the bestower of all benedictions to the living entities based on their desire and qualification. Many living entities approach the Lord with different desires and praying to Him for many things. However, we can see in Mahabharata and Ramayana and other scriptures that the Lord Himself asks for many benedictions from His so-called elders, devotees and devatas. We see in Mahabharata that Lord Krishna went to Mount Kailash and prayed to Lord Shiva for a son (The history is that Lord Shiva once prayed to the Supreme Lord for an opportunity to offer a benediction to the Supreme Lord. The Lord said He will fulfill Lord Siva’s desire during Krishna lila, by praying for a son). In Ramayana, we can see that Lord Rama asked two benedictions from Lord Brahma after the battle with Ravana was over. In Bhagavata purana, Lord Parasurama asked benediction to Jamadagni to bring back His mother and brothers back to life. In all the above situations the Lord always asked benedictions to glorify the other person and nothing for Himself. This is because the Lord by nature is ‘aapta kaama’ (one who has no unfulfilled desires). In spite of this, He asks benedictions from His servant devotees to satisfy and please them.